East Forty Farm is a small farm in Waldoboro, Maine on the Medomak River and the home of Lakin’s Gorges Cheese and Foley’s Custom Sawmill. 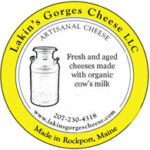 Allison Lakin fell in love with making cheese in 2002, and launched Lakin’s Gorges Cheese in 2011. She makes fresh and aged cheese using organic cow’s milk. Farmer and chef Neal Foley, received culinary training in Europe, and has been teaching cooking for the past 15 years. Neal runs Foley’s Custom Sawmill from the farm. In October 2016, Lakin and Foley settled on a 1700s farm in Waldoboro, Maine, which they christened East Forty Farm and Dairy. This spring will see the creation of a brand new creamery to become the new home of Lakin’s Gorges Cheese. Lakin’s cheese is available at the farm store on OPEN days, alongside Foley’s handcrafted wood products.